After a couple of betas either side of the impromptu bug fix releases of iOS 6.1.1 and iOS 6.1.2, Apple has released final version of iOS 6.1.3 for users on iPhone, iPad and iPod touch. The all-important direct download links and details – are coming up right after the break. The Asian market is very important for Apple’s future business, and although Apple Maps has been subject to much scrutiny since arriving in September, the Japanese version has hitherto lacked even some of the more basic navigation features. That’s all changed with iOS 6.1.3 though, and as well as the implementation of turn-by-turn and better optimization of directions to favor highways over country lanes, Maps in Japan has also added a bunch of 3D landmarks. This is in addition to the improvements made to the Maps from server-side last week. Apart from the Maps update, Apple has also plugged in some security flaws related to lock screen bypass found in both iOS 6.1 and 6.1.2. Of course, with the newly-released software, many of you will be anxious to know whether the jailbreak has been plugged or not. Evasi0n iOS 6.x jailbreak for iOS 6.1.3 has reportedly been patched in this update. At this moment in time, if the preservation of jailbreak is high upon your agenda, please do not update your firmware. There is no way for newer devices to be downgraded, so if you update by accident, you will be stuck with no jailbreak on iOS 6.1.3. 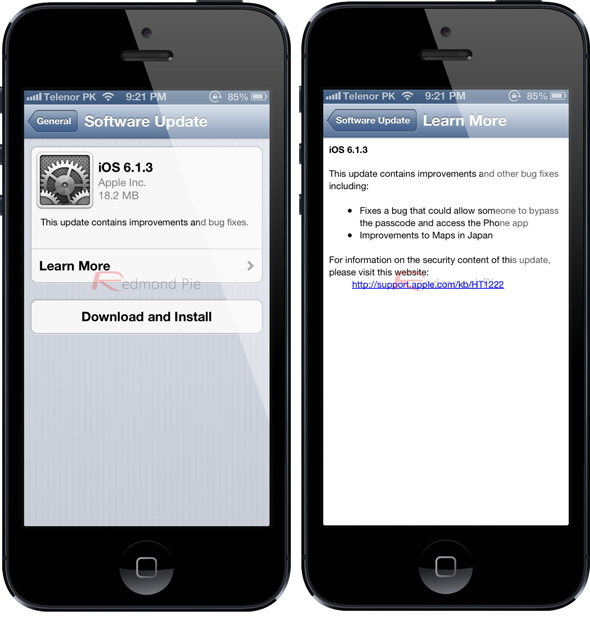 If you want to update to iOS 6.1.3 firmware, there are numerous ways you can go about it. As well as downloading through iTunes and updating, you can also use the OTA (over-the-air) feature, which is located under Settings > General > Software Update. While there’s nothing wrong with taking the OTA route, it is highly recommended you connect to a PC or Mac and update that way. Update x1: Post updated with official direct download links added above for all the supported iOS devices. the firmware is not compatible i have iphone 4s why? Sure wish there were some MD5 hashes to make sure the download was accurate. No, sadly. the iPad 1st Gen only supports iOS 5.1.1.